The relationship between space and politics is explored through a study of French urban policy. Drawing upon the political thought of Jacques Rancière, this book proposes a new agenda for analyses of urban policy, and provides the first comprehensive account of French urban policy in English. Mustafa Dikeç is a Lecturer in the Department of Geography at Royal Holloway, University of London. Dr Dikeç was trained as an urban planner in Ankara, Turkey. He holds a master’s degree in urban design from the University of Pennsylvania and a Ph.D. from the University of California, Los Angeles. He has published articles on space, politics and justice, and on hospitality. 1. Introduction: The Fear of ‘the Banlieue’. 2. State’s Statements: Urban Policy as Place-Making. Neoliberalism, Neoliberalization and the City. The Republican State and Its Contradictions. The Republican Penal State and Urban Policy. 3. The Right to the City? Revolts and the Initiation of Urban Policy. The Hot Summer of 1981: How Novel is ‘Violence’?. Brixton in France? The Haunting of the French Republic. The ‘Founding Texts’ of Urban Policy. Conclusions: Consolidation of the Police. 4. Justice, Police, Statistics: Surveillance of Spaces of Intervention. When the Margin is at the Centre. The ‘Return of the State’. Conclusions: Looking for a ‘Better’ Police …. 5. From ‘Neighbourhoods in Danger’ to ‘Dangerous Neighbourhoods’: The Repressive Turn in Urban Policy. Encore! The Ghost Haunting the French Republic. Pacte de Relance: Old Ghosts, New Spaces. ‘They are Already Stigmatized’: Affirmative Action à la française. Insecurity Wins the Left: The Villepinte Colloquium. Remaking Urban Policy in Republican Terms. The Police Order and the Police State. Back to the Statist Geography. Part III: Justice in Banlieues:. 6. A ‘Thirst for Citizenship’: Voices from a Banlieue. Vaulx-en-Velin between Official Processions and Police Forces. Vaulx-en-Velin after the trentes glorieuses. A Toil of Two Cities (in One). Whose List is More ‘Communitarian’?. Conclusions: Acting on the Spaces of the Police. 7. Voices into Noises: Revolts as Unarticulated Justice Movements. Geographies of Repression: ‘Police Everywhere, Justice Nowhere’. Policies of Urgency: ’20 Years for Unemployment, 20 Years for Insecurity’. Conclusions: Form a ‘Just Revolt of the Youth’ to ‘Urban Violence’. 8. 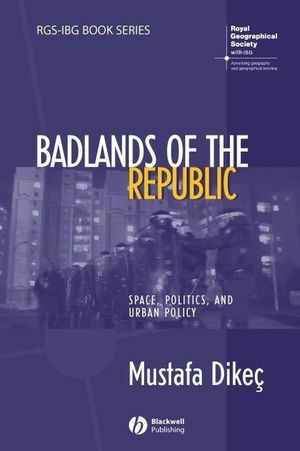 Conclusion: Space, Politics and Urban Policy.